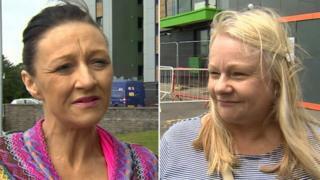 Worried residents at four tower blocks in Swansea which failed safety tests following the Grenfell Tower fire have said they are "unable to sleep". Cladding at the flats in the city did not pass the new tests despite meeting current regulations. The results at four blocks in Clyne Court, Sketty, and another in Jefferys Court, Penlan, come after 149 high-rises in England also failed. The council said it was keeping tenants informed. However residents have raised concerns about "conflicting information". Samples of the same type of cladding used on Grenfell Tower are being tested from seven social housing tower blocks in Wales at the request of the Welsh Government. Claire Lane, who lives on the sixth floor at Clyne Court, said: "I'm unable to sleep, I'm nervous. "I don't feel safe at the moment. It's heartbreaking since the Grenfell disaster. My nerves are gone living here." Lynne Cleobury said letters from the council updating them on the fire safety checks had not been able to put her mind at ease. She said: "[I'm] a little bit worried, I'm on the fourth floor. I have problems with mobility and find that if the lifts don't work I have a lot of difficulty coming down in the fire escape." She also called for the council to hold a meeting with residents: "I think we need to be there to ask questions so they can actually tell us what's going on, whether the cladding does have to come off or whether it's going to stay up." Other tenants at Jefferys Court have also raised concerns. One 68-year-old resident, who lives on the first floor, said he didn't trust "conflicting information" from the council. "They say one thing and say something else, so what do you believe? They say it's failed yet its safe," he added. "I'm not concerned myself really, it's people living higher up because if there's a fire, would they be able to get out? "If a panel is not safe it should be replaced with panels that are safe." But another resident said safety checks being carried out by the council were "reassuring". "I'm just glad they're doing all the tests they can and the council are keeping us up-to-date, trying to keep us calm. It's good," he said. Swansea council said on Monday that extra fire safety checks were being carried out and tenants were being kept informed. Communities Secretary Carl Sargeant stressed that tower blocks where cladding had failed safety tests remain "safe places to be". He told the assembly on Tuesday that on the matter of further action, he would follow any recommendations made by the UK government's advisory panel.